For He that is mighty hath done great things to me: and holy is His Name. And His mercy is from generation until generations, to them that fear Him. He hath showed might with His arm: He hath scattered the proud in the conceit of their heart. He hath put down the mighty from their seat, and hath exalted the lowly. He hath filled the hungry with good things: and the rich he hath sent empty away. He hath received Israel His servant, being mindful of His mercy: As He spoke to our fathers, to Abraham and to his seed for ever. Where else is Mary called blessed through all generations? Is it not another sign of the truth in the only Church founded by Christ? Nowhere else is she so honoured. In fact it is often the opposite. She calls God her Saviour. That special grace she received preserving her from the inherited state of original sin was won by Christ her Saviour and ours. 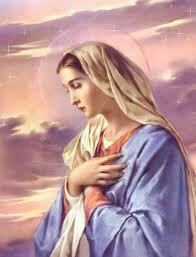 It was intended, with Mary's creation, that we all be redeemed. Our release from that state of original sin is won through her 'fiat' dissolving the disobedience of Eve so that in becoming our Mother she cannot do otherwise than beg her son, on our behalf, that we inherit through the new Eve purity of soul to replace the debt that we inherited through the first Eve.